Thinking Up Ideas: Where Can I Find It? Home > • Language Arts > Know It All > Thinking Up Ideas: Where Can I Find It? After a visit to an African-American history museum, Anna and Ben grow curious about an old house in their community that may have played a part in the underground railroad. Determined to find out about the house’s heritage before it is torn down, they brainstorm places to look for information. 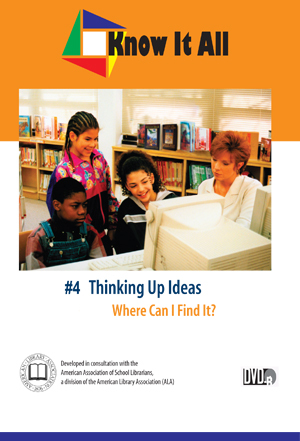 Your students are introduced to brainstorming techniques and to a variety of information sources from both the school library and the community.